dsh Photography (Dave and Sue Haringa) and Linda and Don Johnson will be in the annual show at the Ancaster Fair Grounds on Sat. May 11 and Sun. May 12, 2019, where you can find professional and juried work on display and for sale by the original artisans. A wide variety of items available, especially for the wonderful gift-giving opportunity for that special Mom in your life. 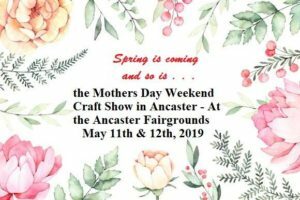 Heading down to the Niagara Peninsula for the many shows and sales on during Mothers Day Weekend? Make sure you stop in at the Pelham Art Festival and stop by Tina Clancy’s booth (#31). While the show is in its 33rd year, it is in a brand new home. 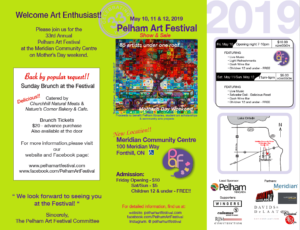 The brand new Meridian Community Centre in Pelham will be home from now on for this exciting and popular show.